I recently did another Current Brush Favourites and I thought it might be nice to expand that little series to other beauty products. 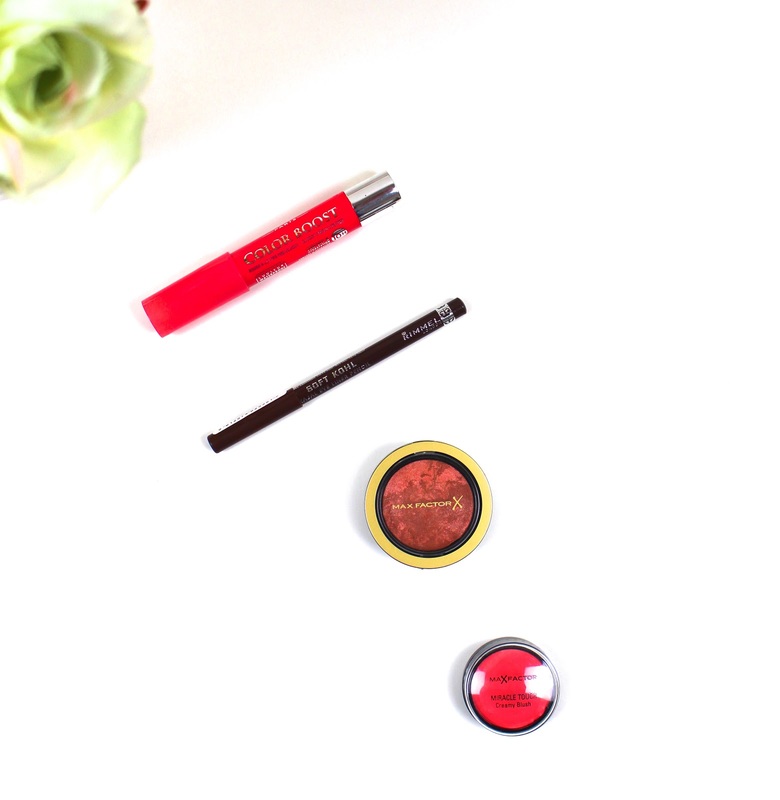 Today I'm doing my current favourite drugstore products. Bourjois Color Boost Lip Crayon in Fuchsia Libre- I don't think I've mentioned this before but it's been a firm favourite of mine for quite some time. The shade is a beautiful fuchsia that's very brightening for Spring. I love the formula of these lip crayons because they're sheer and glossy, but they do have decent colour pay off. Rimmel Soft Kohl Eyeliner in Sable Brown- I've been searching for a shimmer free brown eyeliner and this is perfect. It looks particularly good smudged into the lashes for an everyday look. It's deep enough to give definition but not as dark as black. I find it lasts really well too. Max Factor Creme Puff Blush in Alluring Rose- This is the perfect do it all shade. It warms the complexion whilst giving a really natural flush of colour. You all know I love the formula of these blushes as they have a very finely milled shimmer running through them which adds a really nice glow. Max Factor Cream Blush in Soft Pink- Another Max Factor cheek product! I think this is the ideal product for the summer months. It's a really dewy but easy to blend pink cream blush that looks very natural on the skin and also works on the lips. So those are all of my current favourites from the high street. Let me know if you like these sorts of posts and if you do, I can do them more often. What are you currently loving from the drugstore? I think you'll love this one then- it has absolutely no shimmer or glitter! !